French Emblems: Emblem: Vel in ara. son fust environné de mile dards, ou halebardes. ils sur le propre autel. [Marginalia - link to text]Histoire de Milan. 1. 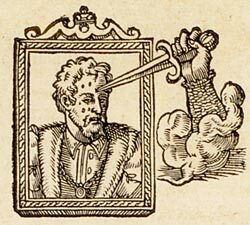 This image is slightly different from the corresponding emblem in the 1551 edition. 2. Ascanio Sforza, brother of Duke Galeazzo Maria, later became a cardinal (d. 1505).